I obviously haven't figured out my new camera, but you can get an idea from this photograph I took on Saturday how beautiful Margaret Moseley's garden is, despite its age. Just look beyond the foreground to the way she has done her paths and beds, which include evergreens (that's Camellia japonica 'Lady Clare' in the immediate background) to show off the deciduous shrubs. It's absolutely magical the way the light filters through the garden. Margaret herself will turn 98 on May 28th. I had left my old camera in her garden a couple of weeks ago and finally got around to retrieving it. I found Margaret in her usual great mood. It was a beautiful day, although cooler and breezier than we'd first thought. She went out and walked the winding paths of the garden with her daughter Carol, a friend and great gardener and helper, W.M., and me. Margaret didn't skip a beat. We went to every viburnum in the garden (they are everywhere - all kinds), and she related the story behind each one. This particular plant seen above - Viburnum carlesii, the Korean spice viburnum - was given to Margaret decades ago by a friend who died soon afterwards. At the time, Margaret wasn't familiar with viburnums, but that lack of knowledge soon changed. When she received a box from Wayside Gardens holding a thin stick, little did she know that it would kick off a decades-long treasure hunt. It was this one, with its sweet scented flowers, that help launch Margaret's garden, which eventually was the inspiration for so many others who had come there. People would visit, and their lives would change. I never left there without feeling I could plant anything at any time, and that there was always the future to look forward to. I usually left with a plastic grocery bag full of plants. Saturday was no exception. W. M. dug me up some charming miniature hostas with a thin white edge. Margaret told me the name, and I've already forgotten it. I'll call her tomorrow, and then I'll write it down. Margaret built up the garden with four major collections - viburnums, hydrangeas, Camellia sasanqua and Camellia japonica. Those were the four major shrubs that formed the backbone of her garden. That is not to say that she didn't have every plant in between - trees, bulbs, perennials, a multitude of other shrubs, flowering vines, roses, ground covers, poppies and larkspur, ferns, hostas and on and on. But, Margaret had a lot of fun chasing down viburnums. When she started collecting, the genus wasn't all that well-known. Now she has all the fragrant types that perfume the entire garden (responsible for the delicious scents on Saturday), the lacecap ones that produce red or blue fruit in fall, and the big, showy ones with giant flowers make you stop in your tracks. 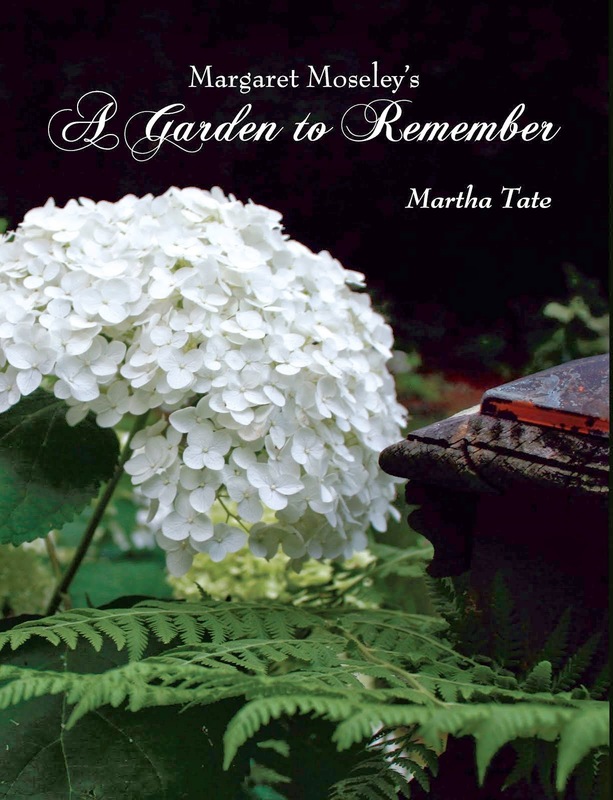 The story of that first viburnum is related in Margaret's own words in the new book, Margaret Moseley's A Garden to Remember. It's basically a coffee table book chock full of color photographs, but it's a great story and includes recommendations for plants that will succeed in the Southeast. Margaret also relates her secrets of success, how she kept a beautiful, made-from-scratch garden going for nearly fifty years (she didn't start gardening until she was 52). At any rate, the main garden started with this one sweet viburnum, a treasure for Margaret and one she insists everyone should own.